Icons of the Virgin Mary (The Theotokas) are in several iconographic types that are known by name. Ways of depicting the Virgin Mary have developed over the centuries, from a stately Roman matron, to an equally stately Byzantine princess, or a richly dressed aristocratic lady, to a grieving and compassionate mother. 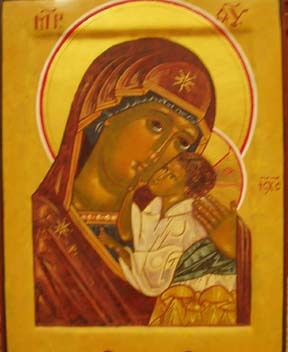 Whatever the type of icon, she always has the abbreviated inscription in Greek or Cyrillic letters to identify her as the Mother (or, the Bearer) of God. This icon is the Virgin Eleousa - the Virgin of Tenderness or compassion or loving-kindness.The gentle humanized Christ and the his mother as loving Mother and Son, assert the doctrine of the Incarnation in visual form. The earliest pictures of Christ show him as youthful, elegant, and clean-shaven like the Roman god Apollo. In the fifth century the bearded face became standard and has continued to be the principal way he is shown. There is a cross in his halo so you can immediately distinguish Christ from the apostles. His hand is in a position of blessing, commanding, or teaching. 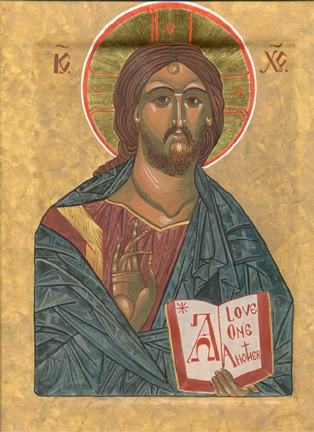 Christ Pantocrator means Christ the Ruler of all. The Pantocrator is not intended to represent Christ as the Jesus of Galilee, but as the awe-inspiring God-Man, the King of the Universe,and the Judge at the end of time.